Matt Brunsman has committed his career to safety in many ways: a safety professional, a certified OSHA 30 Trainer, and Co-Chair of the Northern Kentucky Safety Forum, Matt is committed to improving safety in every way he can. Early in his career, Matt served 8 years in the Marine Corps including a tour of duty in Afghanistan. Like many other safety professionals, Matt found a natural transition from the military to safety. 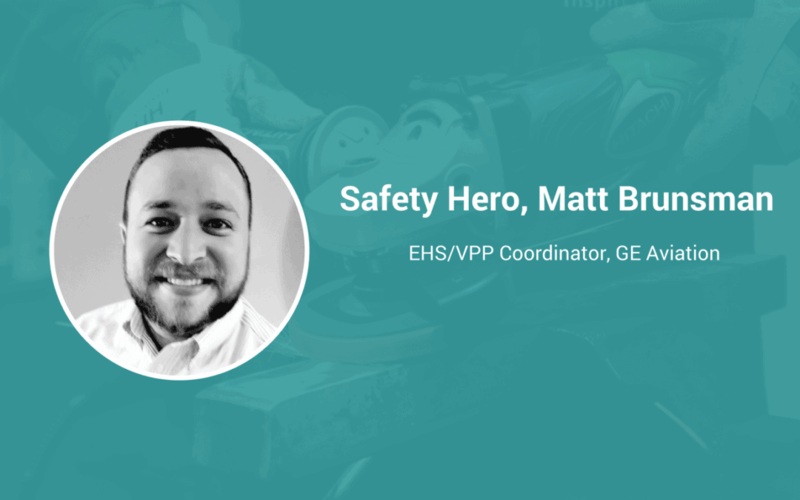 Currently, Matt resides in his native Northern Kentucky where he continues to serve the safety profession as an EHS/VPP Coordinator for GE Aviation. It was a natural transition. As a policeman and serviceman, we received a ton of training during our tours of duty. When I transitioned into the civilian world, I found that the skills I learned during my service directly transferred to the safety profession. Adaptability and resilience. As a safety professional, you have to adapt to all types of situations. Regardless of whom the situation involves, or what it entails, you have to successfully handle it or it could be a matter of life and death. I’ve never personally experienced an incident that has changed my approach to safety, but as a member of the Kentucky Voluntary Protection Program (VPP), I get the opportunity to share experiences and guidance from peers in the region. I’ve learned a ton from other members’ experience. Safety applies to everyone. It doesn’t matter if you’ve been at a company for one day or 30 years – complacency kills. Everyone needs to embrace the importance of safety in order to achieve the best results and make sure everyone goes home at night. Education and commitment to learning about the space. Ever since my time in the military, I’ve dedicated myself to learning more about my craft. Whether that was training during my tour of duty, or through continuous education now. I’d improve the communication aspect within organizations. When you have multiple groups of employees at different locations, it’s tough to know what’s happening. If we, as safety leaders, could know what was happening at all times, or at least better understand what’s happening at each site, we’d be able to prevent incidents before they happen, rather than reacting to them when they do.